This Charleston Style Shrimp and Grits features pink and tender shrimp, creamy and cheesy course grits and spicy andouille sausage. 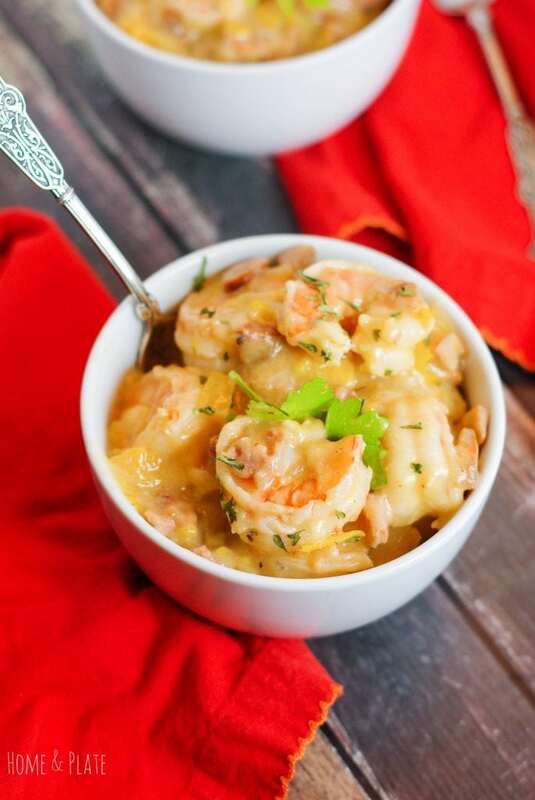 Serve up a plate of comfort in true southern style with these Charleston Style Shrimp & Grits. No quick grits here! It’s cold in Ohio, at 10 degrees and steady. At least Ohio misses out on the blizzard that is rocking the east coast. This snowy weather is the perfect reason to get cooking in the kitchen. So why is it called Charleston style? For this recipe, it’s because of the creamy and cheesy course grits and the addition of spicy andouille sausage to the recipe. 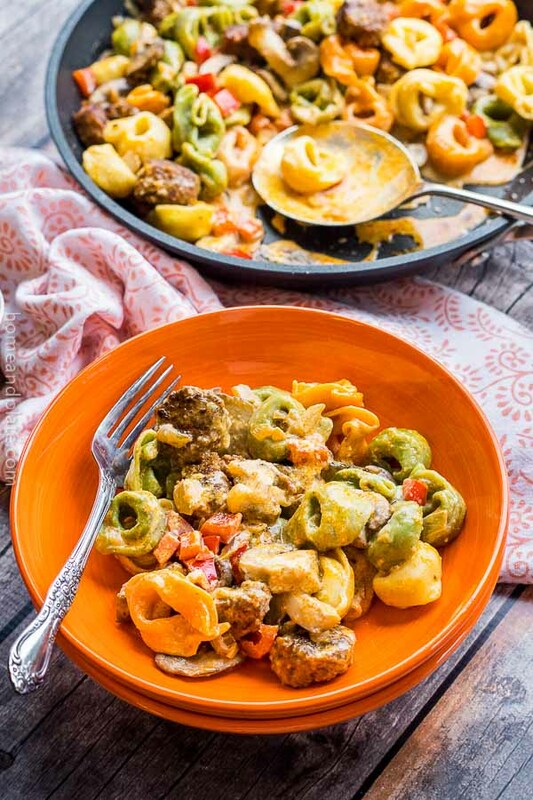 Also, this creamy dish also features a colorful blend of sweet bell peppers. It will warm your belly. 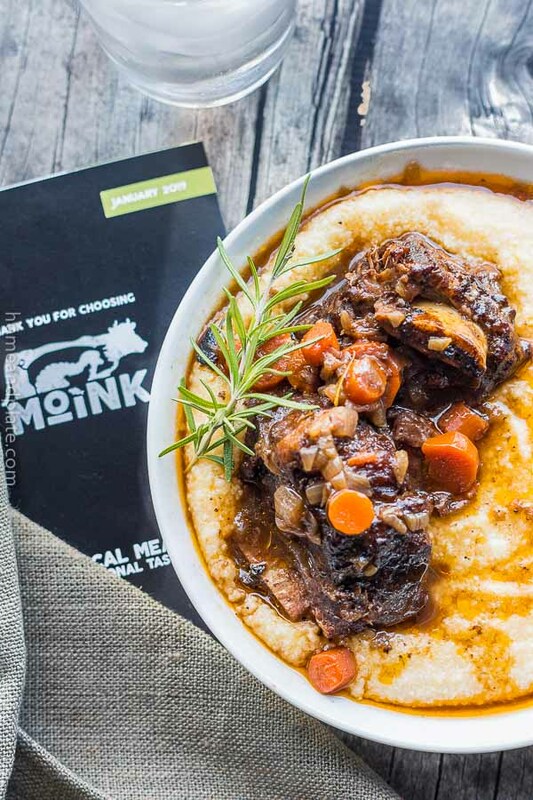 Serve this recipe up on a cold winter’s day. It’s perfect comfort food. 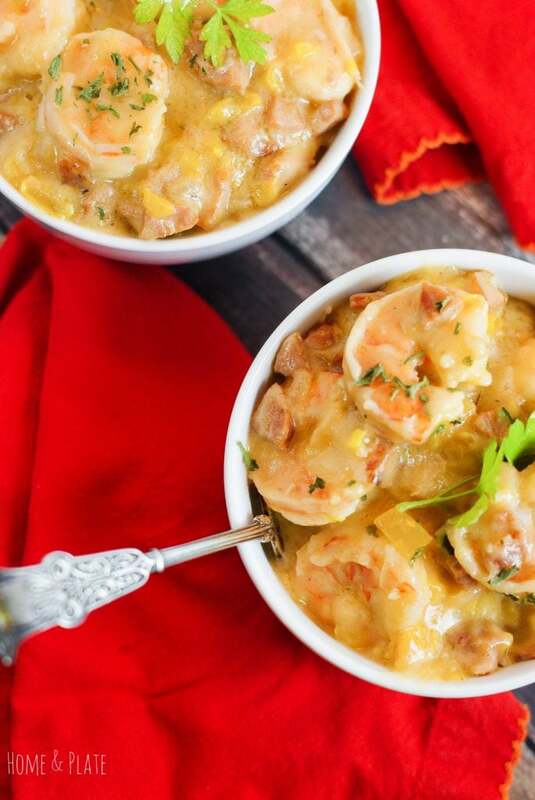 Be sure to check out my Southern-Inspired Shrimp & Grits recipe for a 30-minute mid-week meal that uses instant grits and leftover Honeybaked ham. Fridge and pantry staples: Olive oil, salt and pepper, Worchestershire sauce, cayenne pepper, flour and butter. Shrimp. You need one pound of medium size shrimp, peeled and deveined. So, pick it up already prepared or get dirty at home with the clean up. Grits. Pick up a carton of coarse ground grits, not the instant variety. Andouille sausage. Aidell’s is a favorite brand of mine. It’s spicy and oh, so flavorful. Milk. If you don’t already have a carton in the fridge pick up a small container of 1 percent milk. Onion. Sweet vidalia onion is my favorite variety without being too pungent. Pepper. Pick up a yellow, orange or red sweet bell pepper for this recipe. Garlic. Fresh is best but the jarred variety will work in a pinch. Chicken broth. You’ll need a half a cup for this recipe so pick up a can or carton. Cheddar cheese. Shredded cheddar melts the easiest so grab a bag in the dairy section or use a grater to shred a block. Prepare the grits: Mix together the necessary ingredients and slow simmer for about 15 to 20 minutes before stirring in the cheddar cheese. Sauté the veggies: Cook the peppers, onion and garlic for a few minutes before adding the sausage. Make a roux: Create a sauce using flour, butter and milk. Then, after it thickens add it to the pan of veggies. Add the shrimp: Allow the shrimp to cook for about 7 minutes until pink. Next, add the Worchestershire sauce and chicken broth until the mixture starts to thicken. Serve: Spoon the shrimp mixture over the cheese grits and enjoy! What to serve with shrimp and grits? Prepare the grits in a pot over medium heat. Mix the grits, water, salt, cream and milk and simmer until thickened for about 15 to 20 minutes. Add the olive oil to a large skillet cook the onion, peppers and garlic until the onion is translucent, about 5 to 8 minutes. Stir in the diced andouille sausage and cook for a 5 minutes. In a small sauce pan melt the butter over low heat. Add the flour to make a roux stirring for five minutes to incorporate. Add the butter flour mixture to the large skillet. Next, add the shrimp, Worcestershire sauce and slowly add in the chicken broth stirring until the sauce thickens and the shrimp turns pink, about 7 minutes. Add the cheddar cheese to the grits and stir until melted and creamy. Serve the shrimp mixture over the cheese grits. Oh my goodness! I love the andouille sausage addition. As a Midwestern gal I am so glad to have come across this recipe. Yes…andouille makes a huge difference. Delicious! Thanks Jamie! this looks insane! I want to eat it right now! 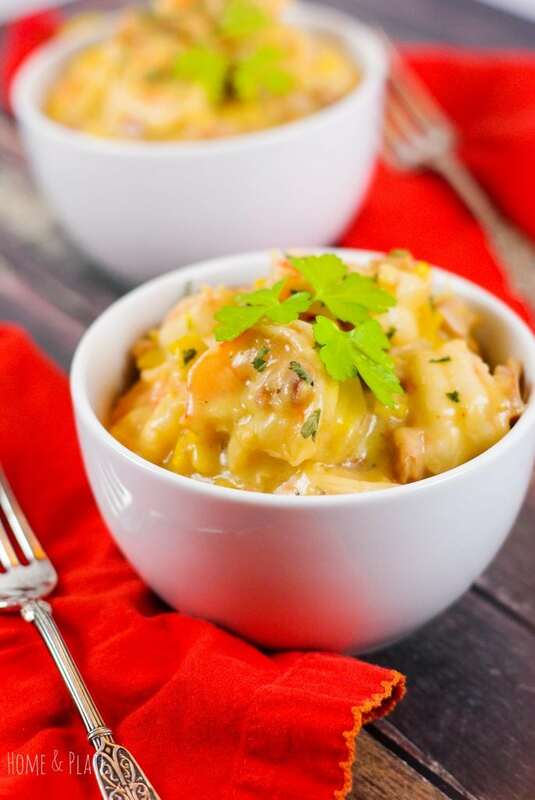 I love shrimps and I’ve never tried them with cheddar! So good. I promise it will become a favorite! This looks so comforting! Who doesn’t like shrimp and grits! I’ve never made them but this may be my first! Yum! Yes…give this recipe a try. You’ll love it! This looks so yummy! I can’t wait to try this for dinner soon. Thanks so much for the recipe. Grits sometimes get a bad rap but they truly are delicious. A touch of cayenne pepper definitely makes the dish. We love going to Charleston. Now I can make this and think about all those fun times. It’s been a long time since I’ve been there. Itching to get back.